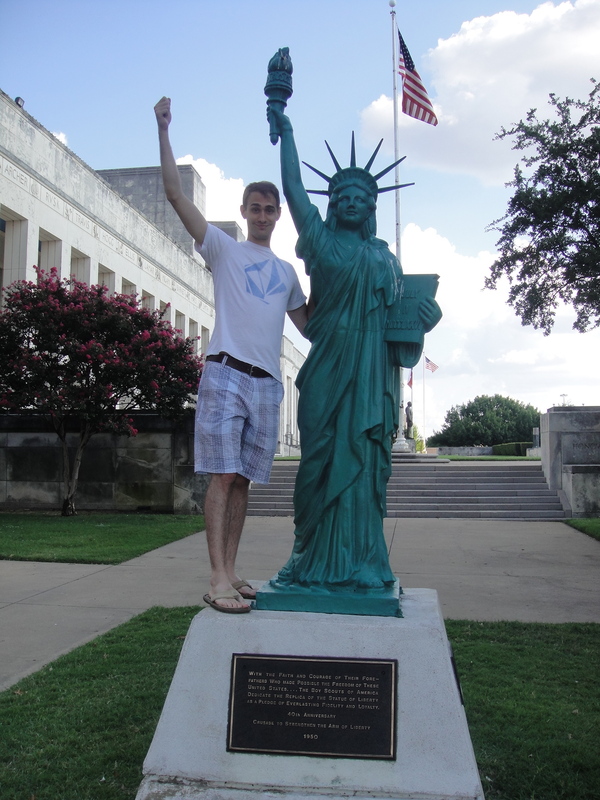 i had been waiting for the taste of dallas for 2 months. 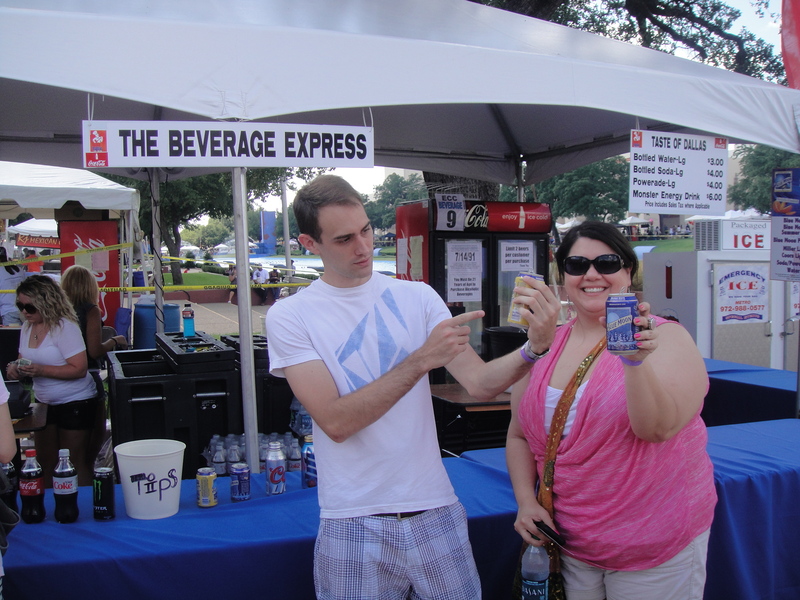 i have been going to the taste of addison for a few years now. i love it. 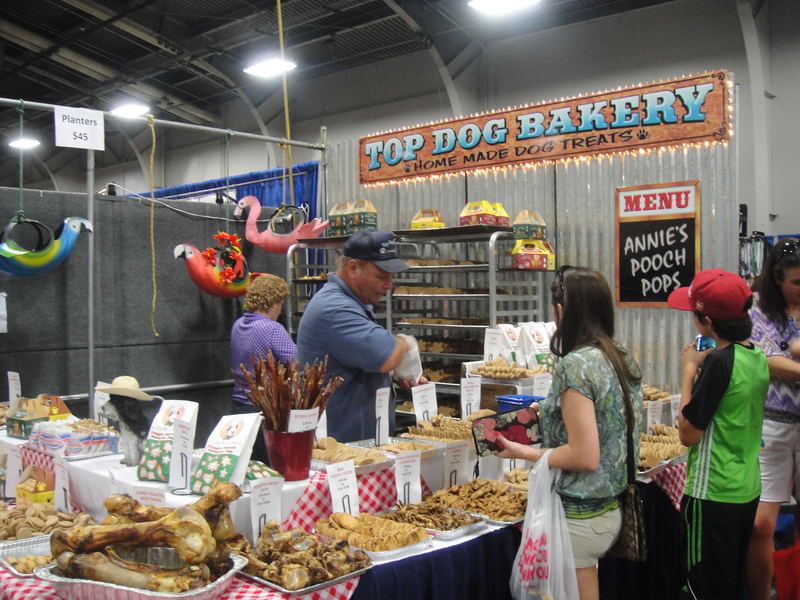 food vendors, crafts, games, rides, music, all rolled into one weekend out of the year. 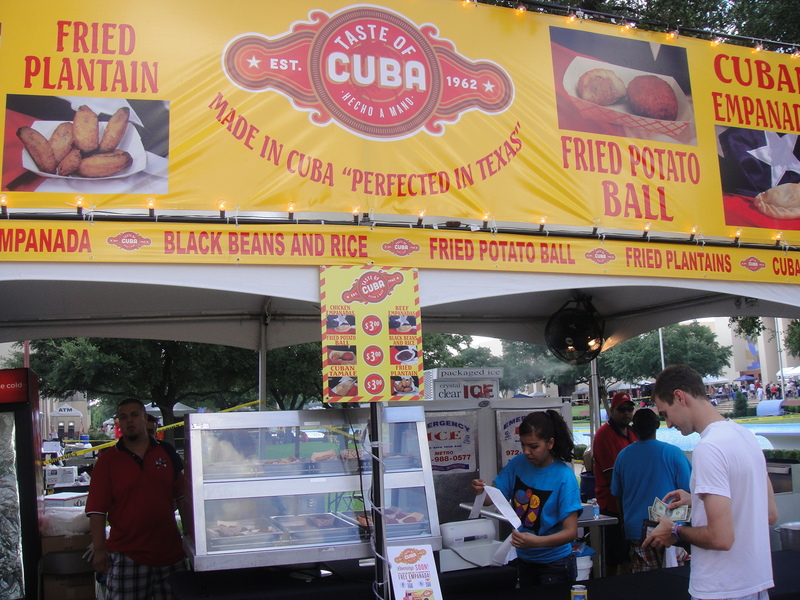 well, i heard of the taste of dallas back in may, when the taste of addison was going on…and i thought, “hmm…wouldn’t it be BIGGER?” so i researched it, and it sure enough was. 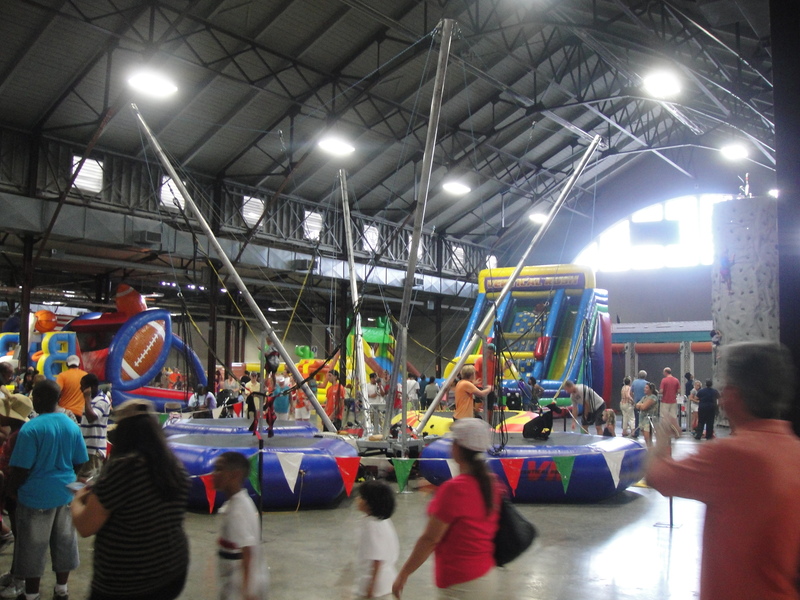 it was double to triple the size of taste of addison…and it was going to be held at fair park, which is where the annual state fair of texas is held. 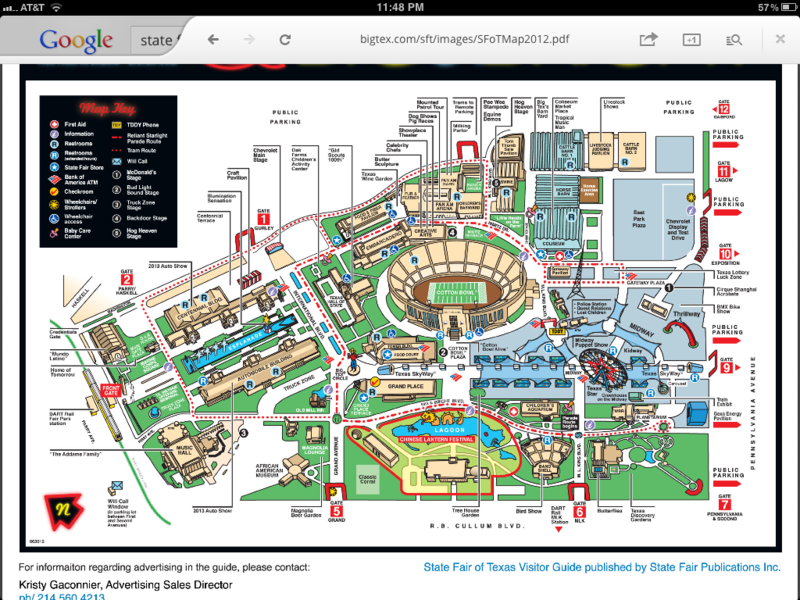 for anyone who isn’t familiar with the state fair of texas, it happens to be the biggest state fair in the US. 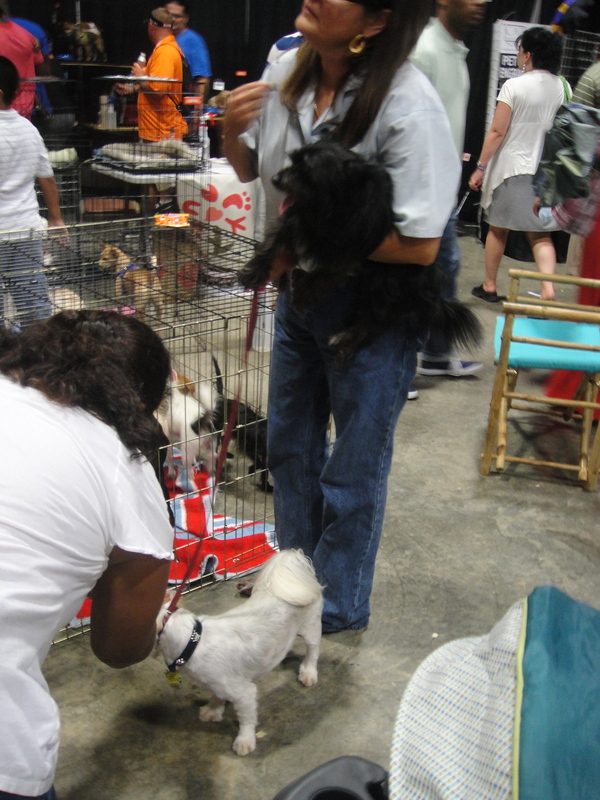 open for a one month period, it attracts over 3 million visitors per year. it’s 80 acres of insane fun and lots of walking. 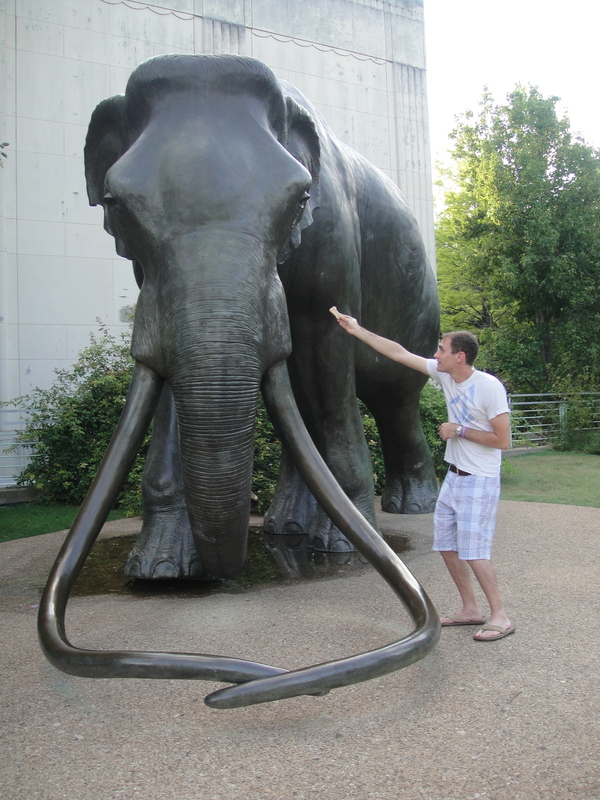 anyways, i obviously wasn’t expecting the taste of dallas to be THIS BIG. i mean, i WISH it was, but it was actually held around the automobile building and the centenniel building, which are the two long buildings on each side of the esplanade (the strip of water on the left of the map). the funny thing is that i didn’t even expect anything to be indoors, but i was very glad it was, because i’m sure it was well over 100 degrees yesterday. when i’m having fun i don’t really care if it’s 120 degrees. nothing is going to stop me from eating food. 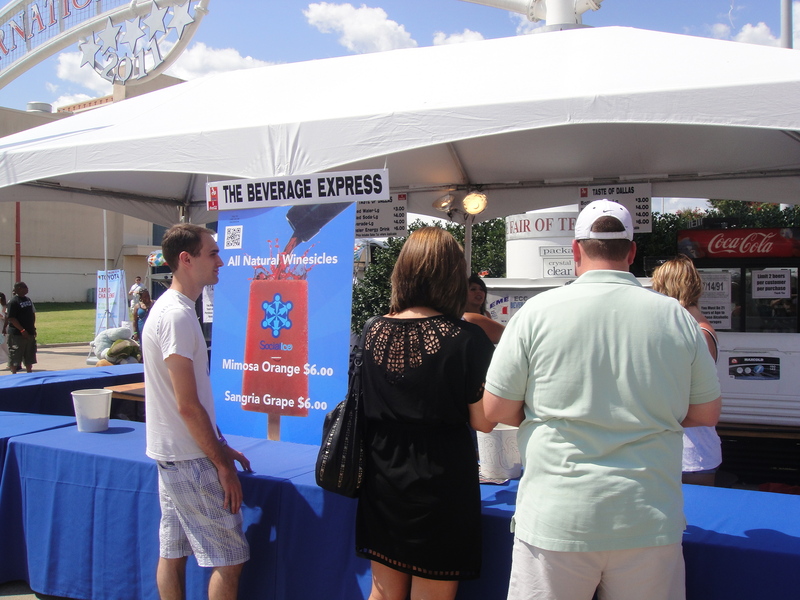 on friday, i posted a facebook status about the taste of dallas selling ORANGE MIMOSA and GRAPE SANGRIA winesicles. i even mentioned that i wanted to try them. i don’t drink, i hate wine, and i just can’t take the taste of alcohol, period…but winesicles? they just sound cool! it happened to be the first booth we saw. and duncan had to try an orange mimosa popsicle. he enjoyed it. and it looked promising. 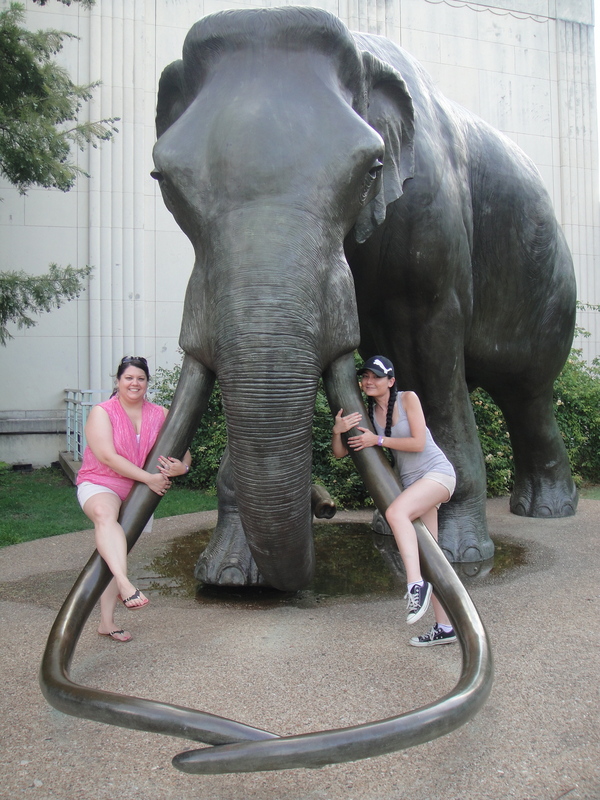 we couldn’t figure out where the food was because the area was huge, so we went into the automobile building. inside was the wine and spirits event (you basically stand in the longest line ever to show your ID to a guy before you taste a ton of booze in a closed off section), some dallas observer show that required a $20 entrance fee (supposedly you got to taste test foods and vendors in a closed off section, no ID required), some cooking shows open to the public, and a ton of taste-testing vendors that sold anything from fudge to bbq sauces to dips and candy. and doggy treats. 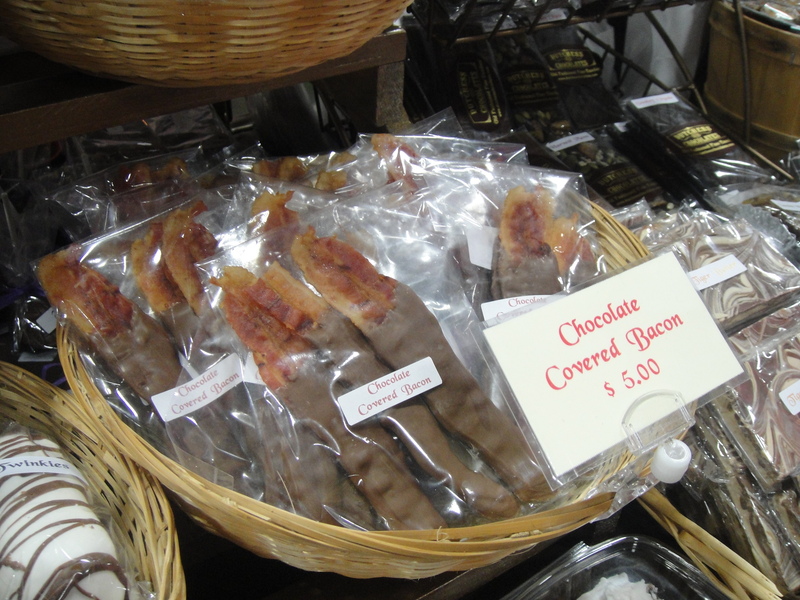 duncan’s first choice of purchase was the chocolate covered bacon. i didn’t get to try it but i knew that i would have enjoyed it if the bacon was almost burnt. if it was crunchy and dipped in bacon…AND FRESH…it would have tasted great. i like my bacon almost burnt. i even request it like that when i eat out and order it. it wasn’t the best thing duncan tried, but at least he tried it! i like the bacon chocolate from neiman marcus. if you haven’t tried it, do so. i think it’s about $6 a bar and it’s delicious. we passed a booth of artwork and i wanted the first thing i spotted. a piece with a cardboard robot. it was adorable. it’s the piece on the top left. i fell in love with it. it was the only picture i took of it, and when we came back around a few hours later, it had been purchased for $80 (“what a steal!” one of the guys said). 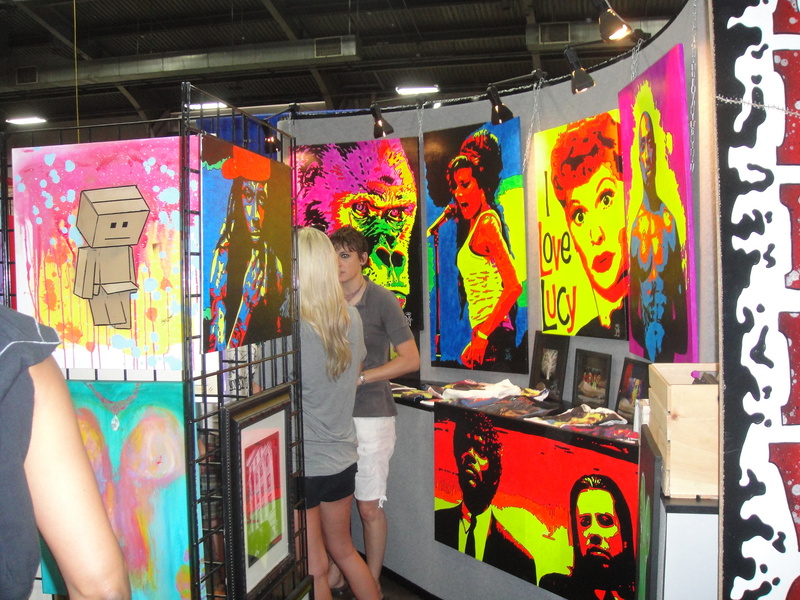 the artists of this booth are having an art gallery at the end of the month. i will be attending it with my friends. we have our flyers as reminders. 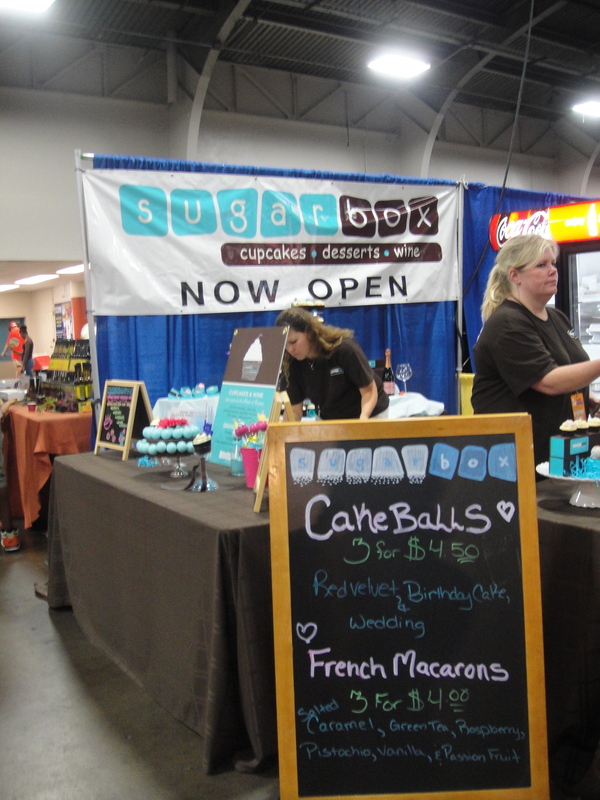 my first purchase was at sugar box. i was about to walk by it until i saw “FRENCH MACARONS.” i have never had a macaron. i have a friend, melina, who posts macaron pictures like crazy on her facebook. that’s how i got interested in them. and then i started reading blogs about them. mostly blogs about having disasters trying to make macarons, which then made me scared to attempt them. 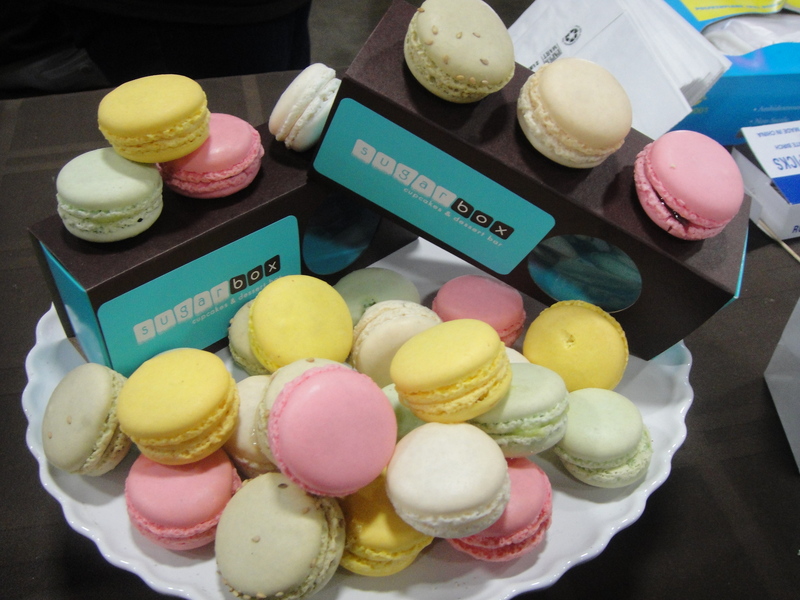 but i’ve never even seen macarons in a bakery here in dallas, so i HAD to try them. duncan and i chose pistachio and jennifer had a salted caramel. okay. a few thoughts. first of all, i’m a little picky with my baked goods. i like to have them how they are normally served. these macarons, along with the cake balls and the mini cupcakes, were stored in a fridge before being served…they’re not normally served out of a fridge in a bakery. so that was already a strike against it. second of all, pistachio is such a tricky flavor and i shouldn’t have had it as my first choice. my sister makes a pistachio cake that’s to die for. every time she makes it, i eat it for breakfast, lunch, and dinner…until it is gone. 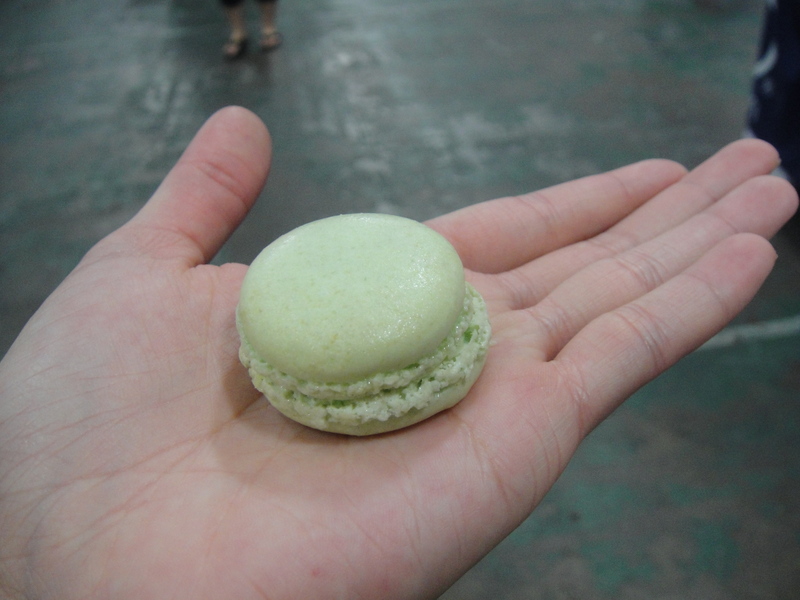 this pistachio macaron tasted like…i don’t know…sugar. BUT….in the bakery’s defense, this was the taste of dallas…and they weren’t in their kitchen…and i know that this pistachio macaron would taste a thousand times better in their bakery than from a booth, so as my first time having one, i am pleased…and yes, i will be visiting the actually bakery to try their fresh ones. =) of course i got their business card! they have 2 locations in dallas. 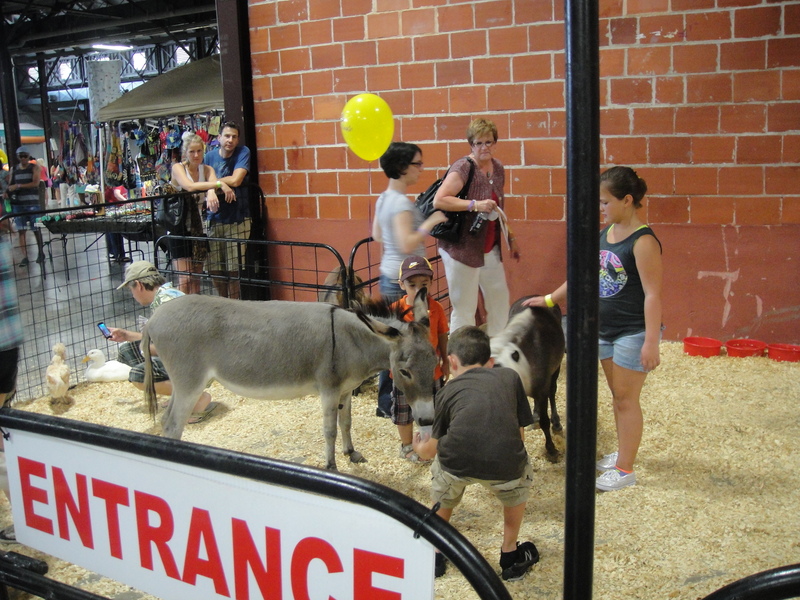 remember the dallas observer event that had a $20 admission which i mentioned earlier on? well, we were walking out of the building and i spotted CAKES……………………..
going back outside, we stopped by the beverage express, where duncan and jennifer grabbed their beverages before we started the real food walk. 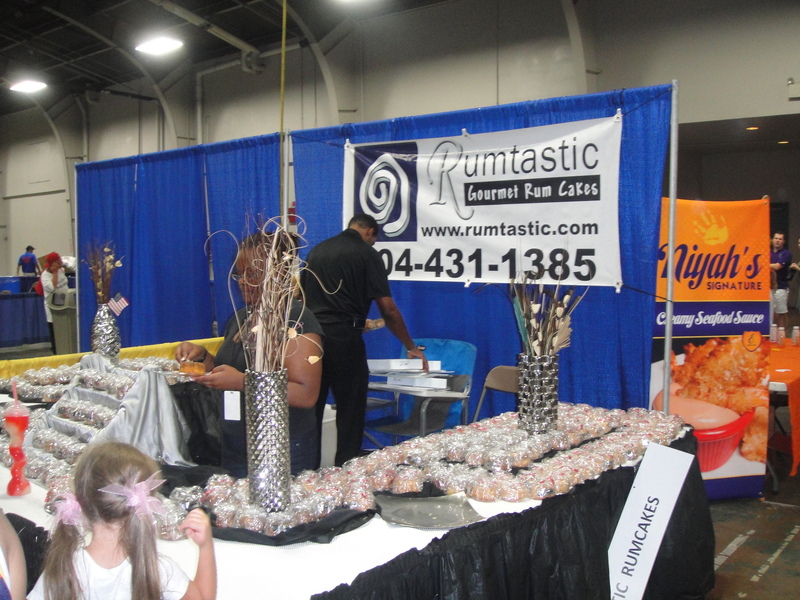 our first booth stop was at the taste of cuba. duncan had never tried fried plantains before. my favorite ones are from the el salvadorian chain of restaurants called glorias. their bananas are sweet and whatever batter they fry them in is awesome because it leaves some crispy, sweet shells around the bananas. back home in saipan, our fried bananas are called MADOYA. they taste almost exactly just like these fried plantains except the bananas are different. they’re both good. i’m not sure how duncan liked these plantains, but to me they were ON POINT. i stole one. 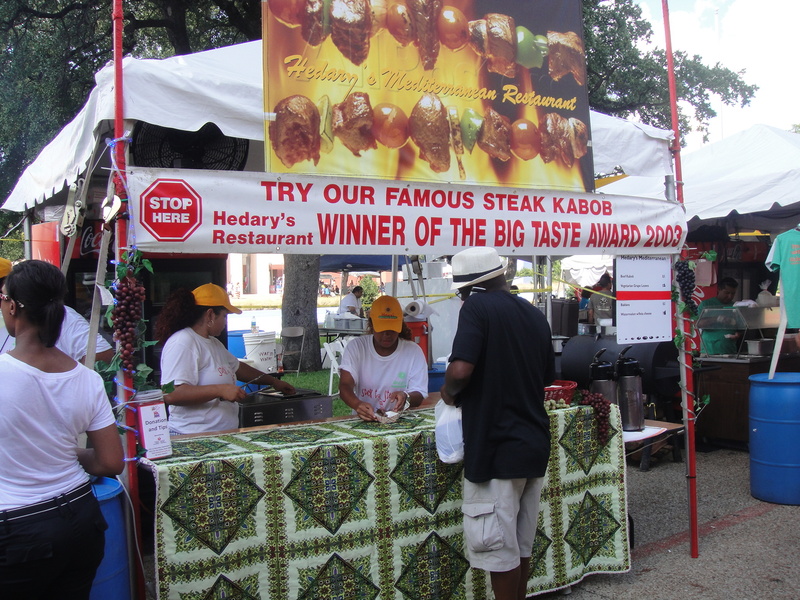 my first food booth was the steak kabob booth. all i read was “winner of…” and i went right to it. if it wins an award or is the first of something or if it’s known for something, i’ll have to try it. at first i didn’t want to try it because i didn’t want the veggies on my kabob stick…but then jennifer pointed out that it was just a stick of meat and i was so there. it was awesome. and the kabobs came right off the grill-i wish all things were THAT FRESH. 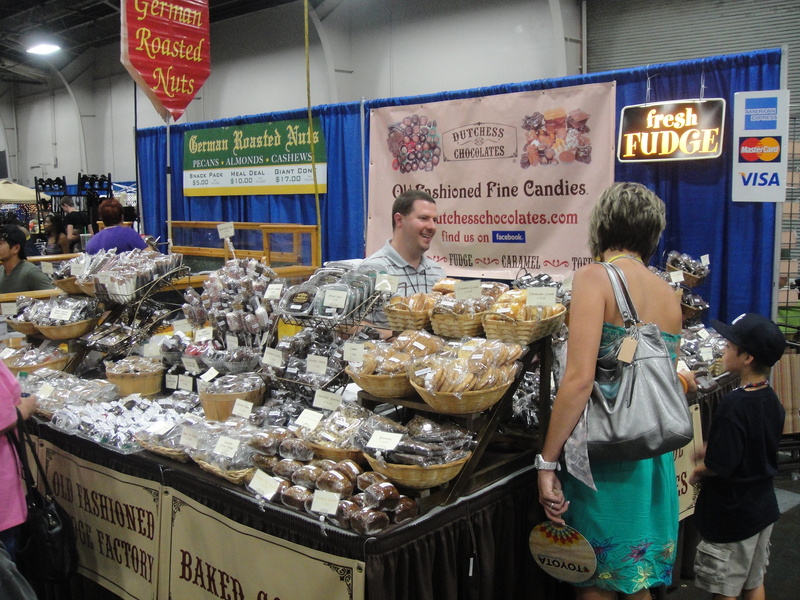 my next stop was the cake ball company. 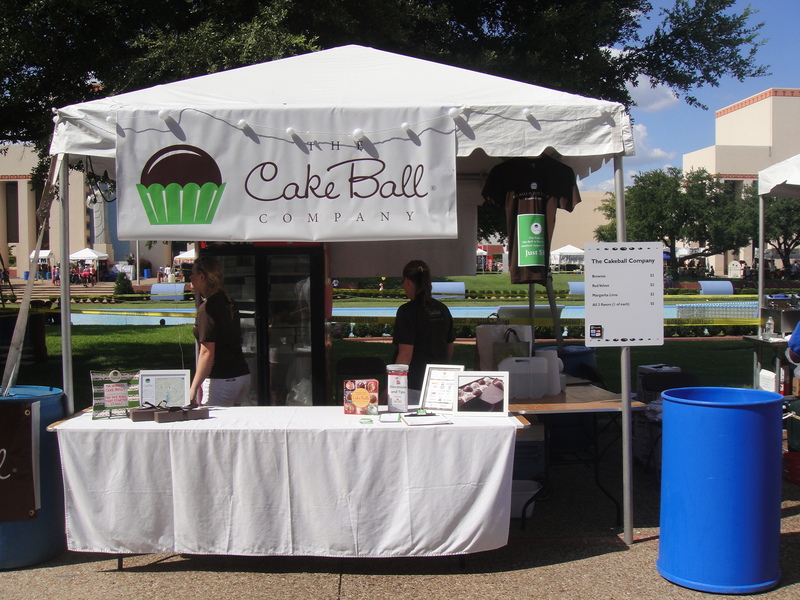 the cake ball company has only one location in dallas. 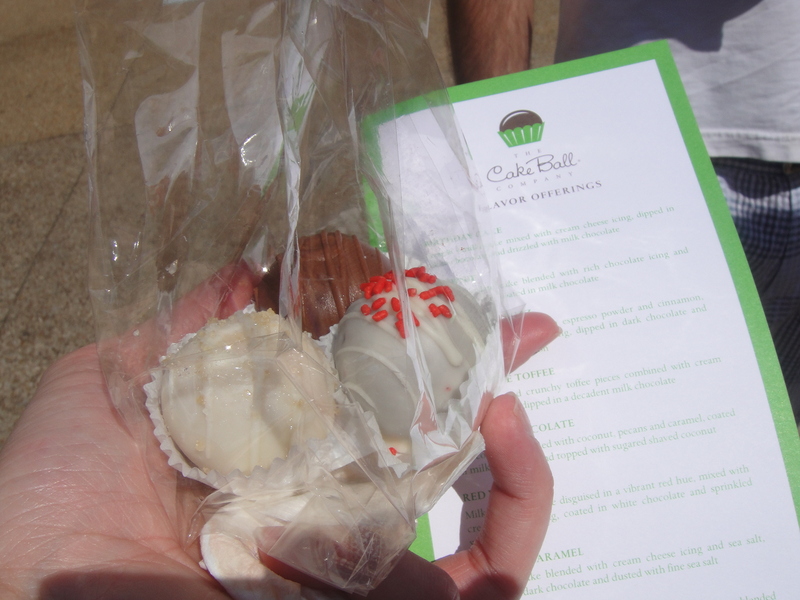 i have never heard of them but i always have to try every cake ball that comes my way, so i got their “one of each” bag, which had a margarita lime, red velvet, and brownie cake ball. duncan and jennifer both wanted the margarita lime and i wanted the red velvet, so we each took a bite of something and passed it on. i think we were all looking forward to trying the margarita lime the most…and i think we were all equally disappointed in the flavor the most out of all of them. the cake ball was sprinkled with what has to be sea salt and DANG, was it POTENT. i mean, it was the FIRST thing you tasted when you bit into the cake ball. pure salt. i don’t even know if the cake ball would have been good if the salt wasn’t on it, it was that powerful. the brownie cake ball was just a standard chocolate cake ball…or a fudgy one. it was good for what it was. but the red velvet. yes. that was my favorite. now, red velvet is one of the LEAST favorite of my cake flavors. i mean, red cocoa cake? there’s nothing amazing about that. but there are so many different variations of the flavor, some way more amazing than others. and the funny thing is that of all red velvet flavors i enjoy, they’re mostly in cake balls and cheesecakes. besides, based on the bazillion blogs i’ve read lately, red velvet is so last year. blue velvet is in! as we reached the end of one part of the strip, we found another winesicle booth…so it was time to try the grape sangria winesicle. i have never had sangria before, but i love grape popsicles…well…i love anything that is grape flavored..
…and i hated the winesicle. big surprise. 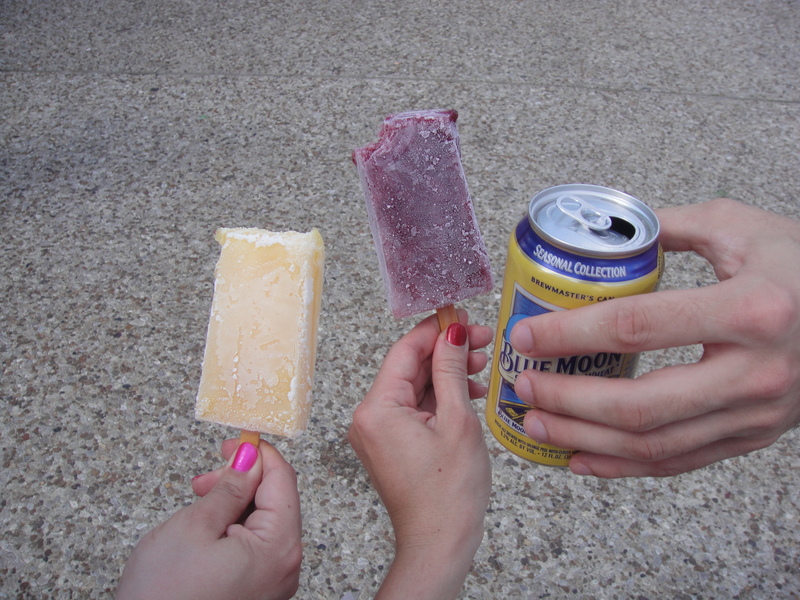 i loved the popsicle idea and i loved the grape flavor…but it tasted like i chugged a few gulps of wine. so duncan got a grape sangria winesicle and got to compare it to the orange sangria that he had earlier. he said he liked the grape more. 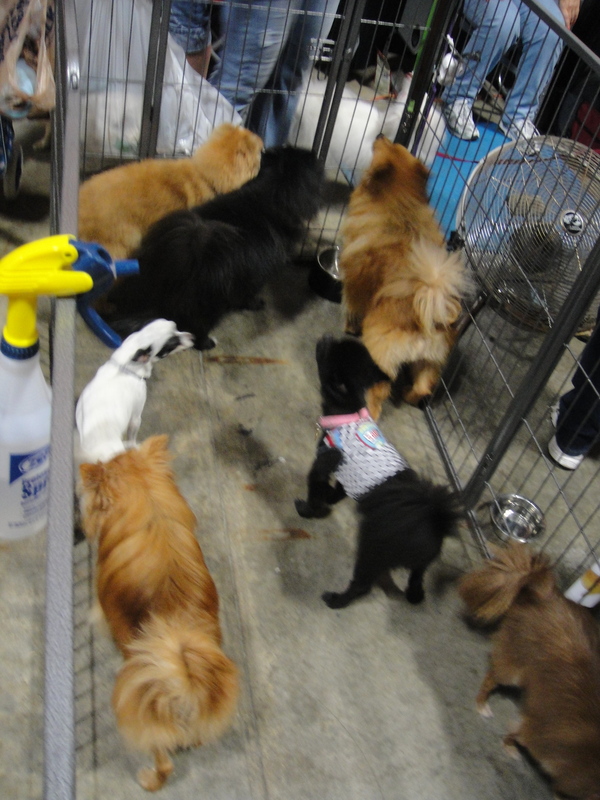 as we were hanging out in the shade and finishing up the winesicles, we noticed dogs everywhere…..which brought us to the centenniel building. i took a picture of the pink sign because that’s my last name. haha. inside the centenniel building was not anything i expected. 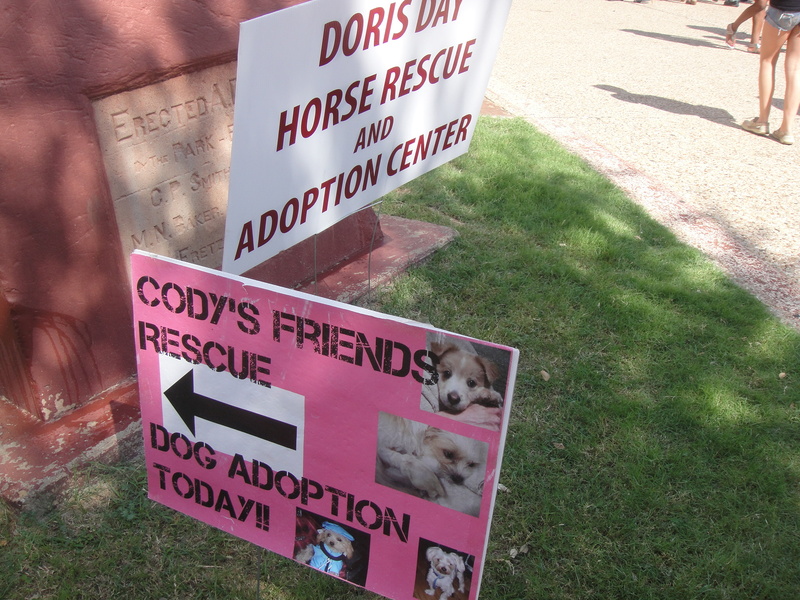 there were dogs everywhere for the first section, and then there were kids rides and inflated bounce houses and slides and even a rock climbing wall. my nephew would have had a ball in there! 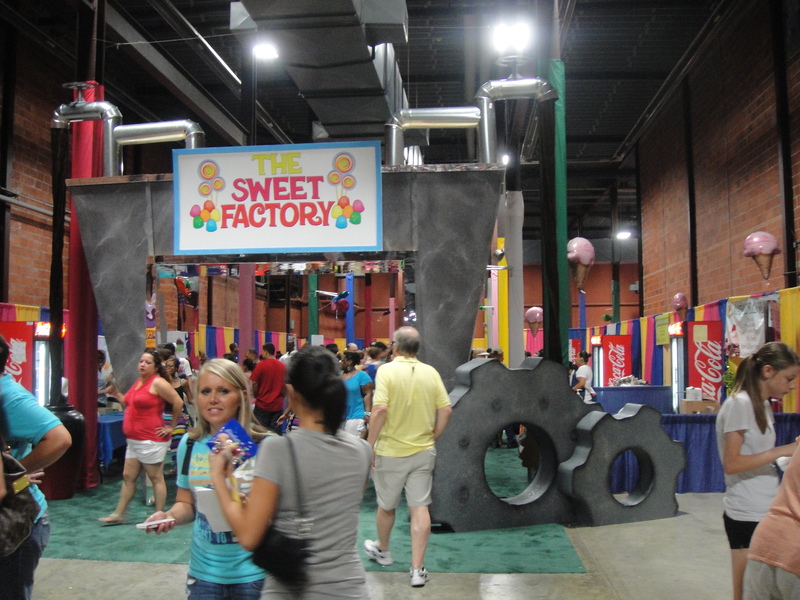 and it’s a dang good thing we walked further down because at the end was THE SWEET FACTORY! it was delicious. 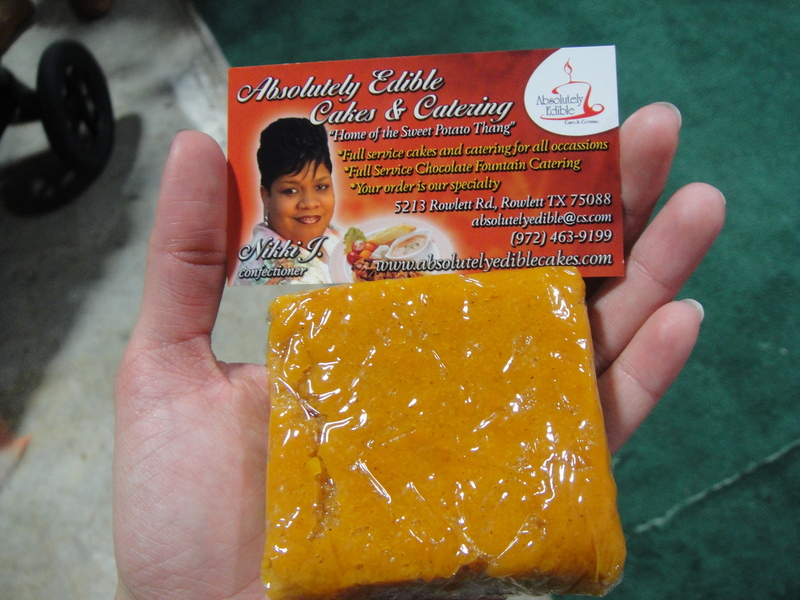 i guess i could describe it as a sweet potato square with some crust made out of amazingness. it actually looked like there was a layer in between the sweet potato and the crust, but who cares, it was just more yumminess. i loved it. 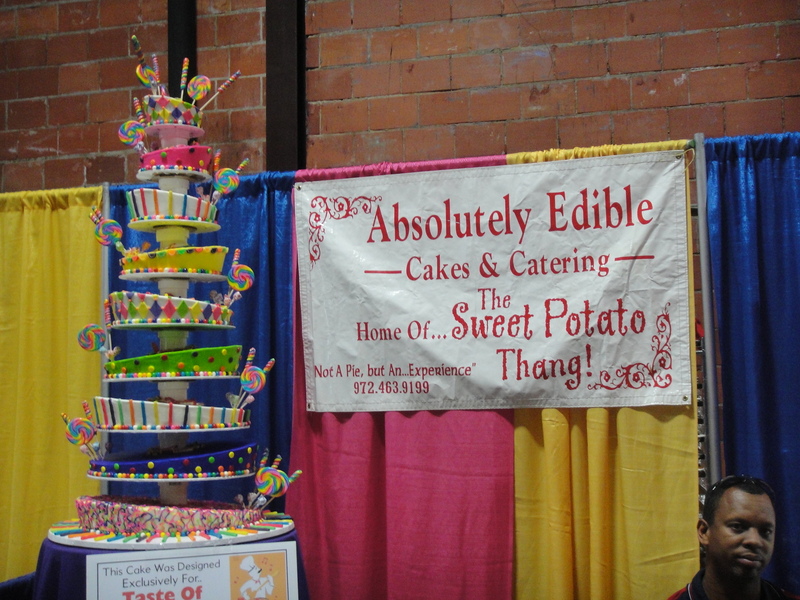 as far as the bakery name, absolutely edible, i’m not sure. 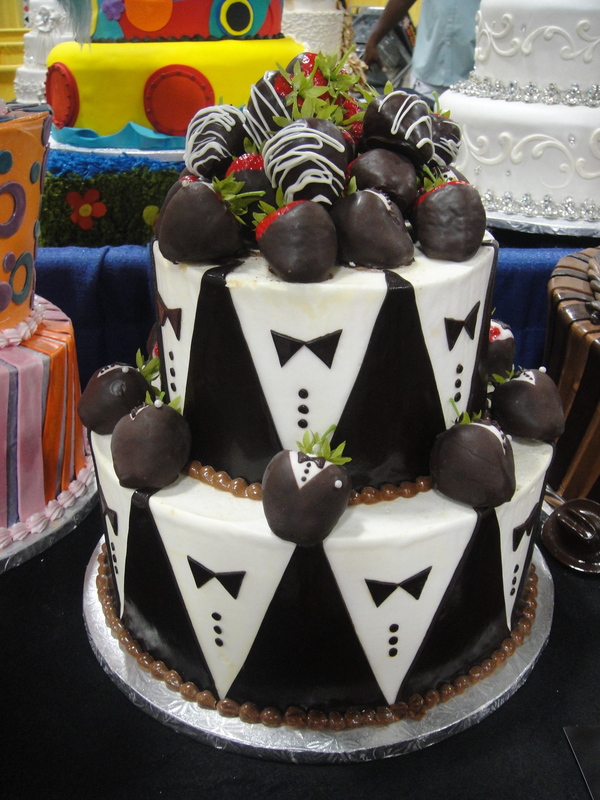 absolutely edible cakes. who’d want a cake that wasn’t? i don’t get it. 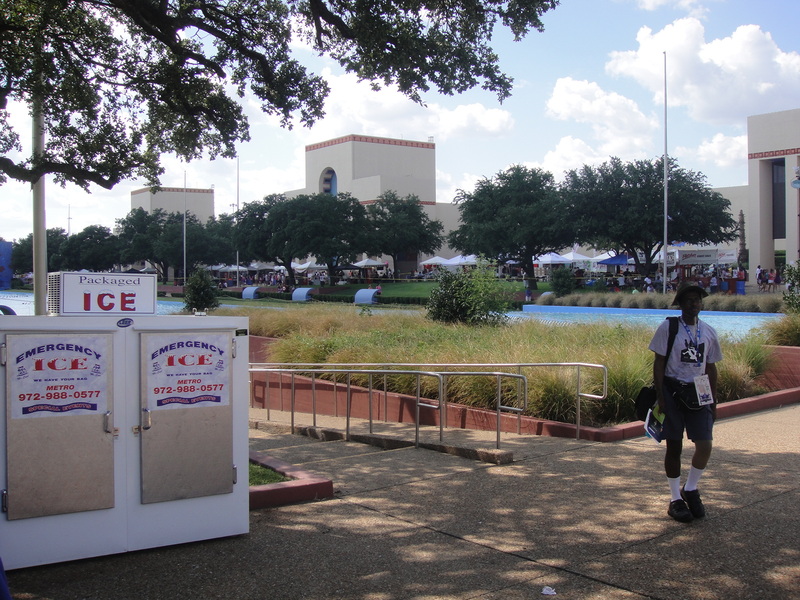 when we got out of the centenniel building, WE FOUND THE FOOD TRUCKSSSSSSSSSSS!!!!!!!!!!!!!!!!!!!!!! 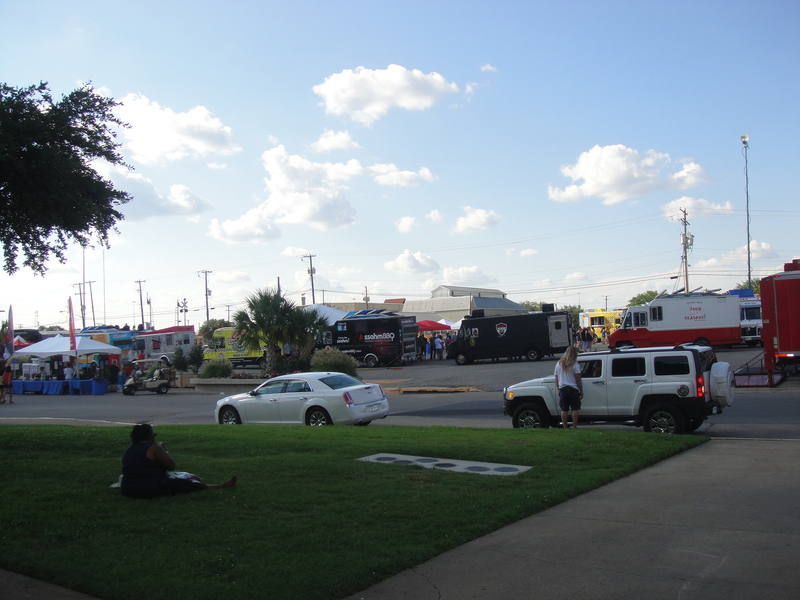 the dallas food trucks were what i was looking forward to visiting at the taste of dallas. i have heard many good things about them and i have never been able to try them when they are in the arts district downtown. 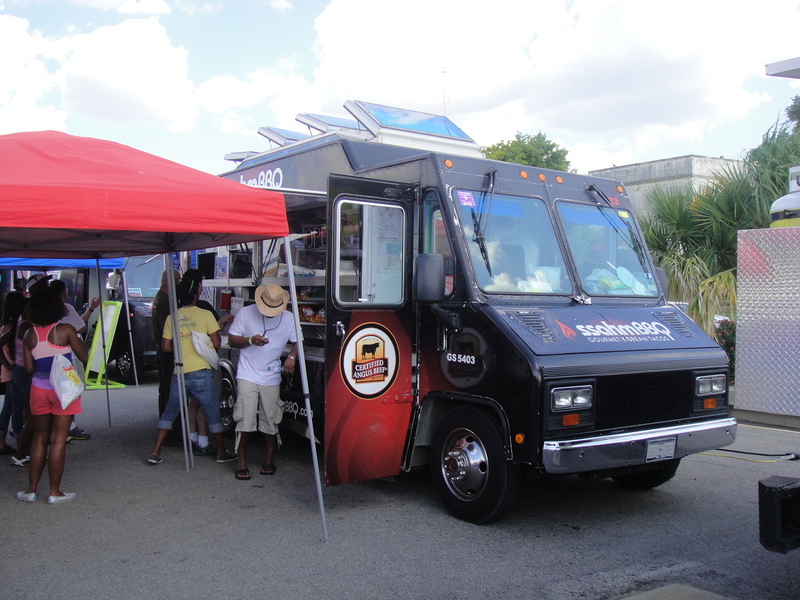 there is a website that lists which trucks are available at the food truck court during the week and of course they are not available on the weekends. 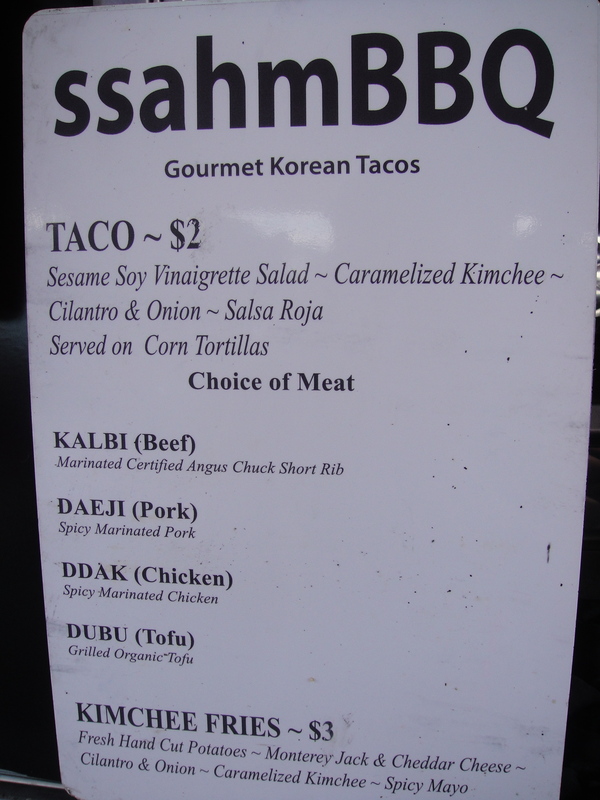 i was looking for a korean bbq truck and i found it. 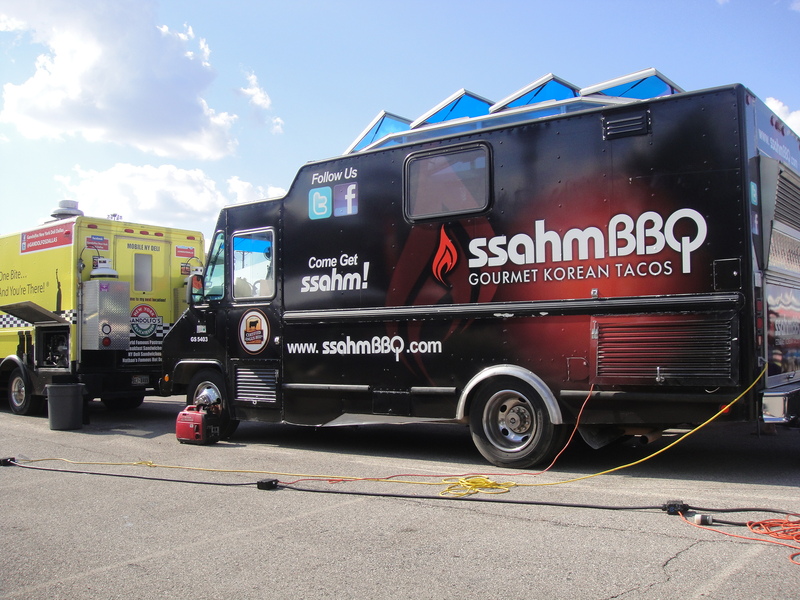 ssahm bbq, pretty much the only truck i wanted to go to. i didn’t even look at the cup cakin’ truck. it didn’t matter anymore. 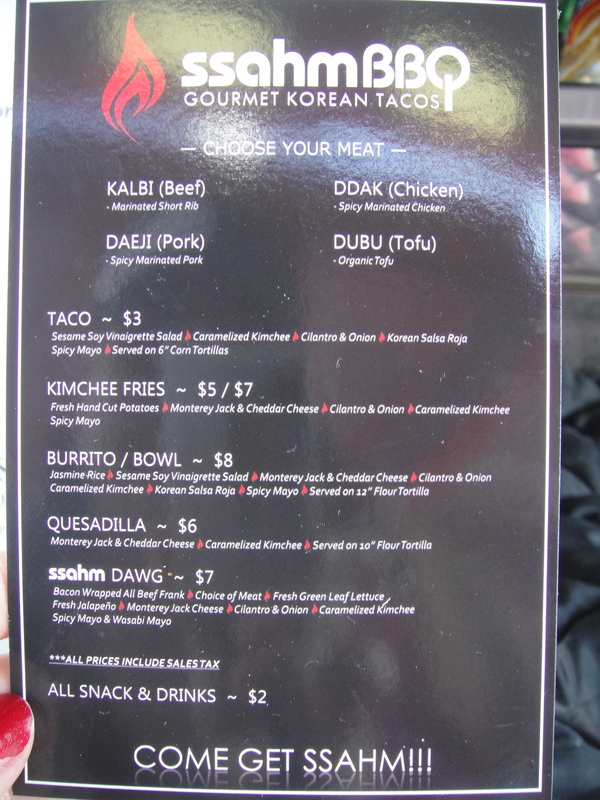 jennifer and i wanted the kimchee fries but i let her get it and i got a korean beef taco. duncan got a beef taco and a chicken taco. i just wanted to TRY IT. and boy, were we in for something. KIMCHEE FRIES. 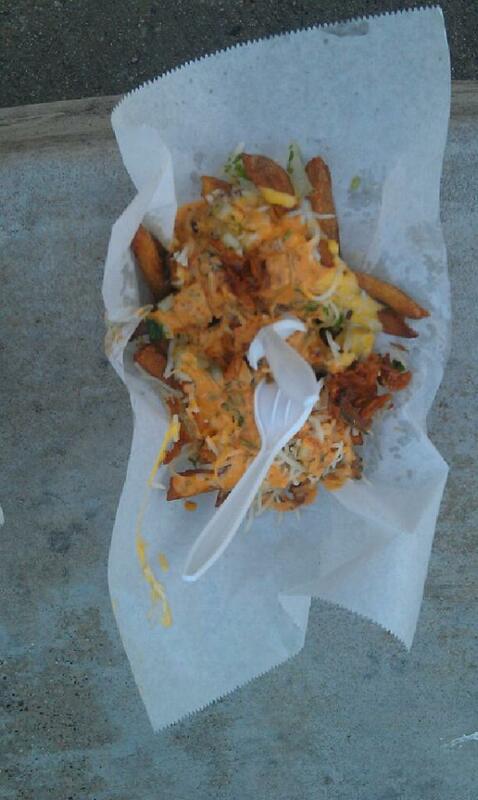 who would have thought that the kimchee fries would be the best thing in the taste of dallas. or one of the best things i have tried this year. 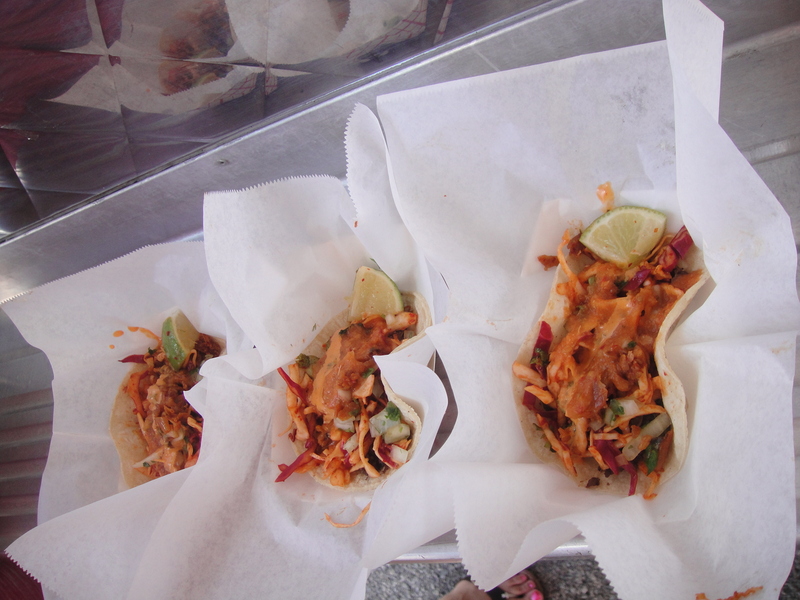 as i was ordering the tacos, the guy noticed me taking a picture of their taste of dallas menu. after all the food samples and desserts and meats and this korean goodness, we were stuffed. 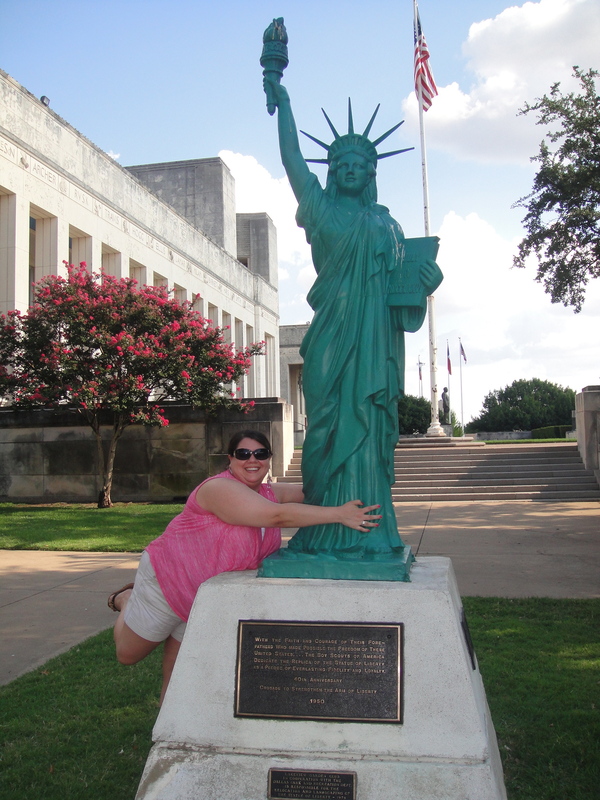 STUFFED…so we kinda hung out for a bit until i saw……..the statue of liberty. 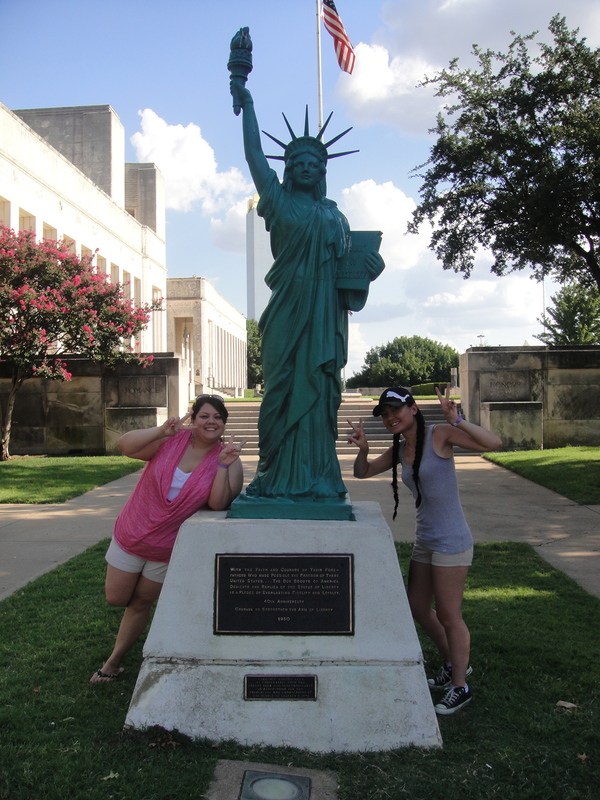 and more pictures before i jump to another major part of the day…. 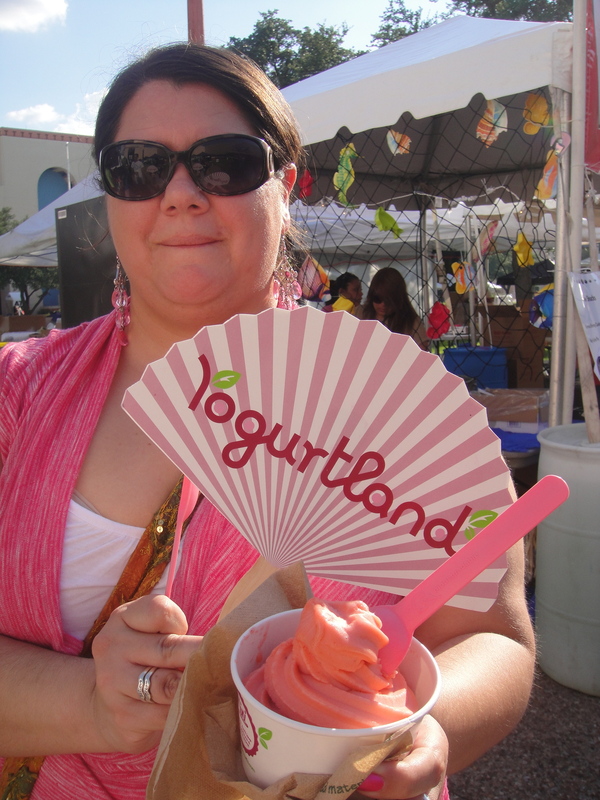 that strawberry lemonade yogurt was amazing and perfect to finish off our foodathon. we didn’t even put any toppings on it, it was perfect the way it was. i want more. right now. so…..because it was hot out, we did a small walk-through back inside the automobile building, the first building we walked through. 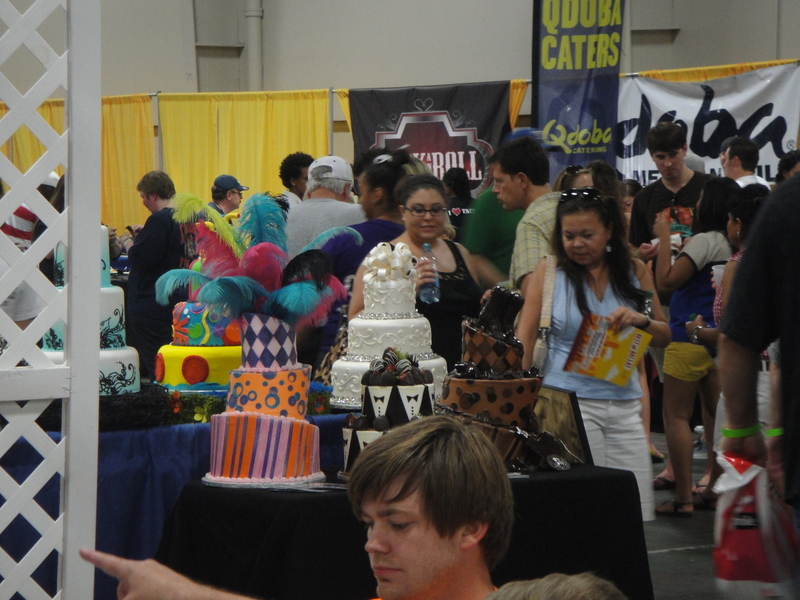 we noticed that the dallas observer section was emptied out…..EXCEPT FOR THE CAKES. jennifer kept telling me to ask if i could go in and take pictures of the cakes but she ended up asking a security guard. 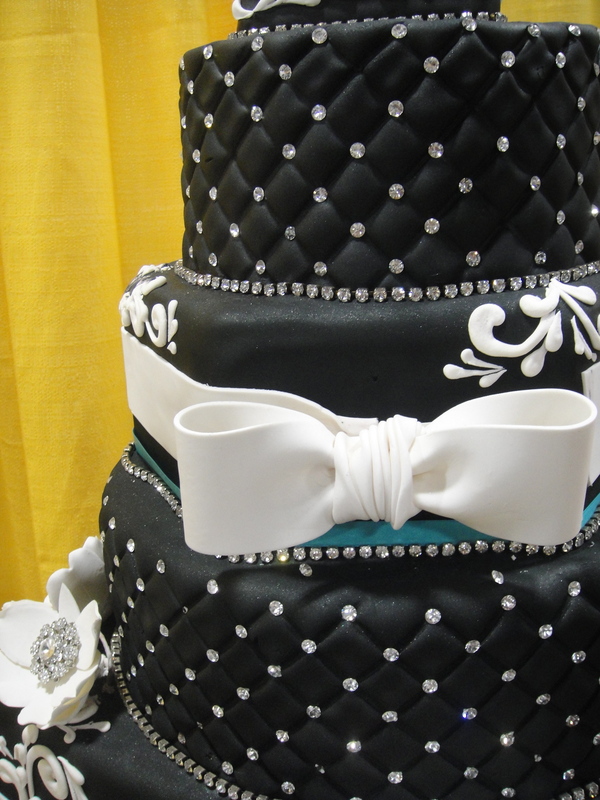 one of the cakes looked familiar, but i could only see a little portion of it…….and i was right. 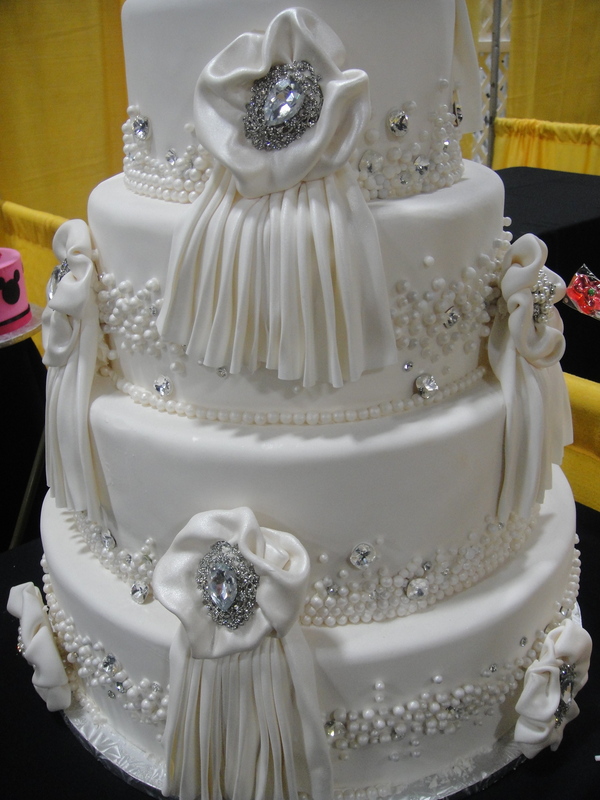 when the security guard KINDLY let us come in to take pictures of the cakes, it was THE CAKE GUYS!!!!!!! 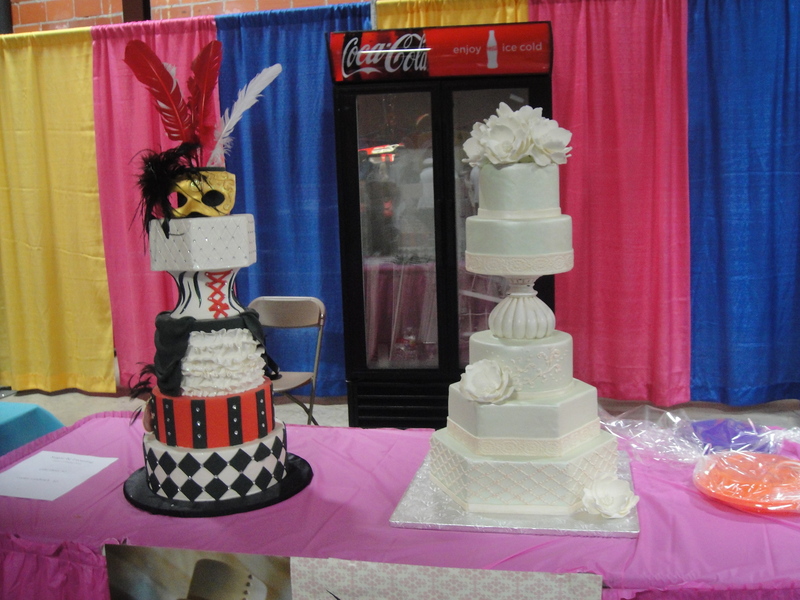 back in march, i attended a wedding cake competition and got to taste test cakes. 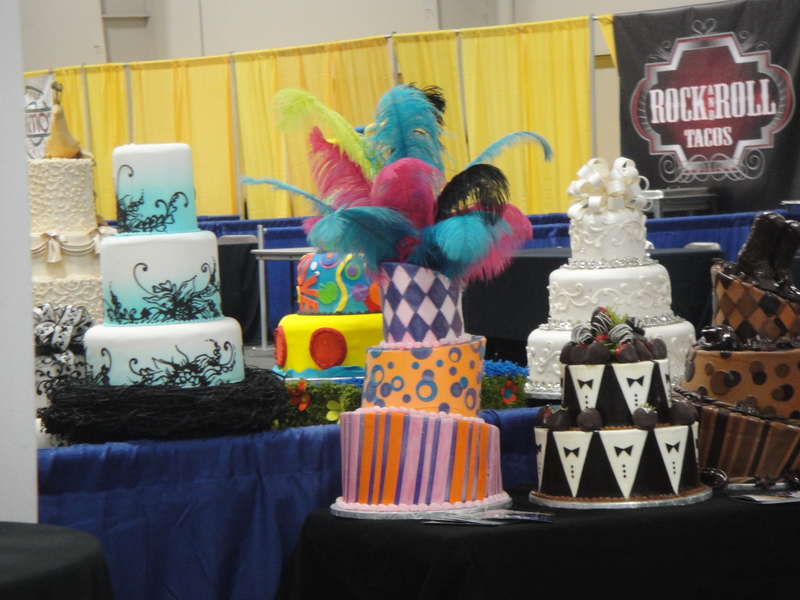 in my blog, i tasted cakes, the cake guys were one of the competitors…and FIRST PLACE WINNERS…of the night. 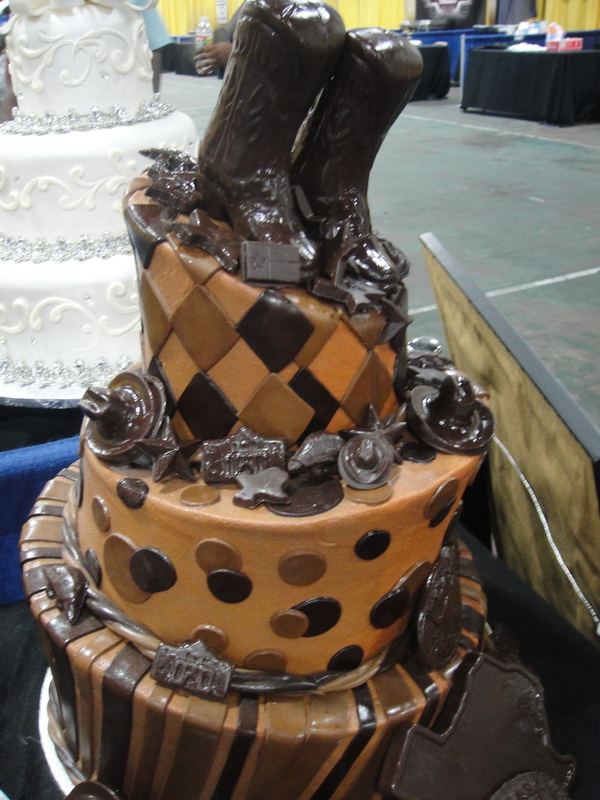 in fact, their winning cake was present! 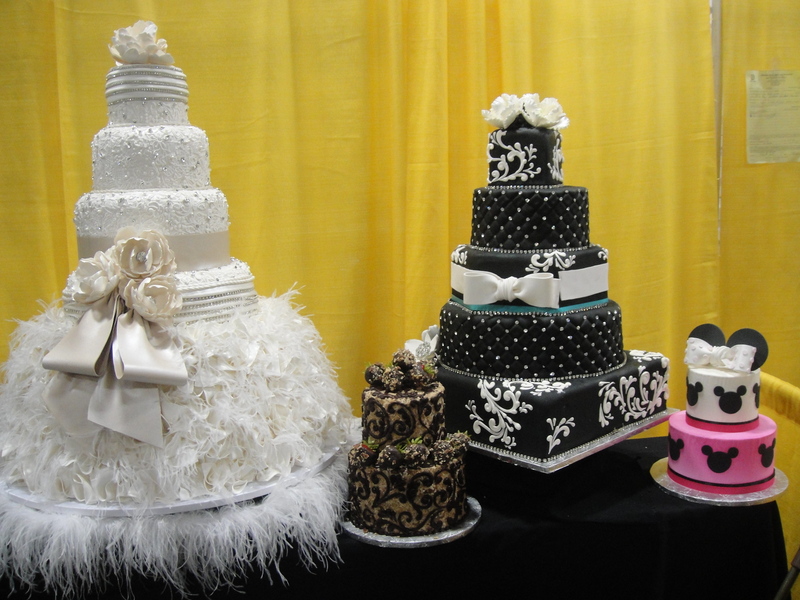 amazing cakes, once again. 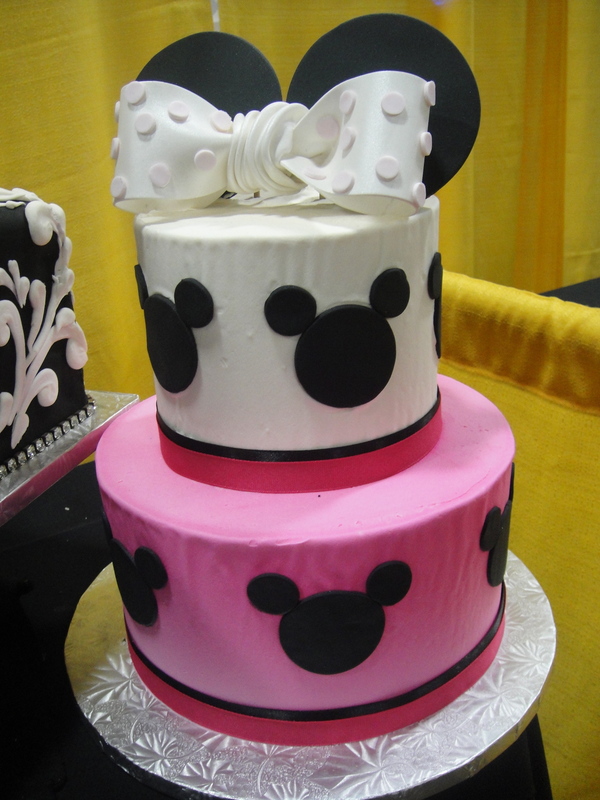 i love the cake guys. i told one of my friends to get her november wedding cake from them and she is. awesome! and that was my sweet ending to the taste of dallas. i took 200 pictures, but if i posted all the pictures i want to, i’d never sleep tonight. it’s already 3:30 a.m. and i’m tired as heck. 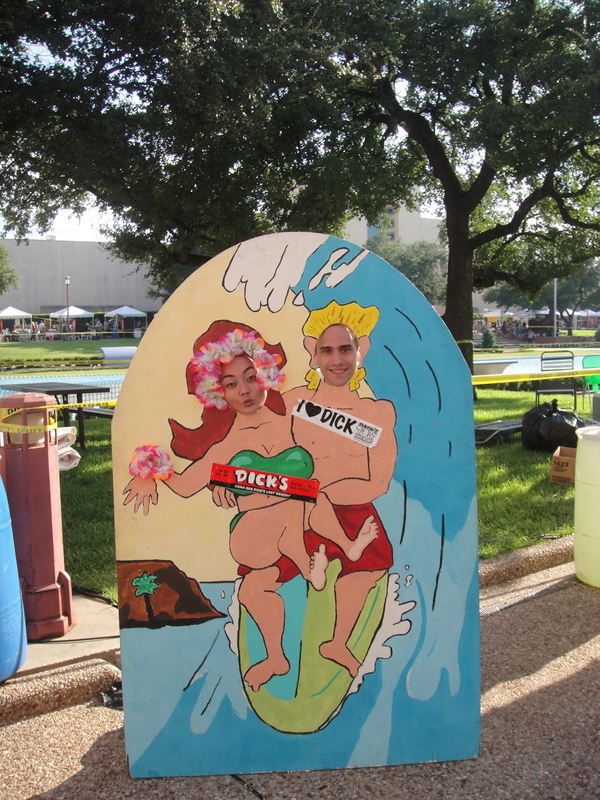 the taste of dallas was awesome. i’m glad i could take that off my list of “things to do for the first time in 2012.” i had a BLAST with jennifer and duncan. i hope they did, too. the only thing i regret is not eating more kimchee fries. i don’t think that would have been possible unless i would have stayed there for another 2 hours. i would have, but there was actually a birthday party going on at my house and i couldn’t miss it. i have to post those pictures another day because there are enough in this blog alone. on our way out, we took more pictures. hope y’all had a fun weekend! 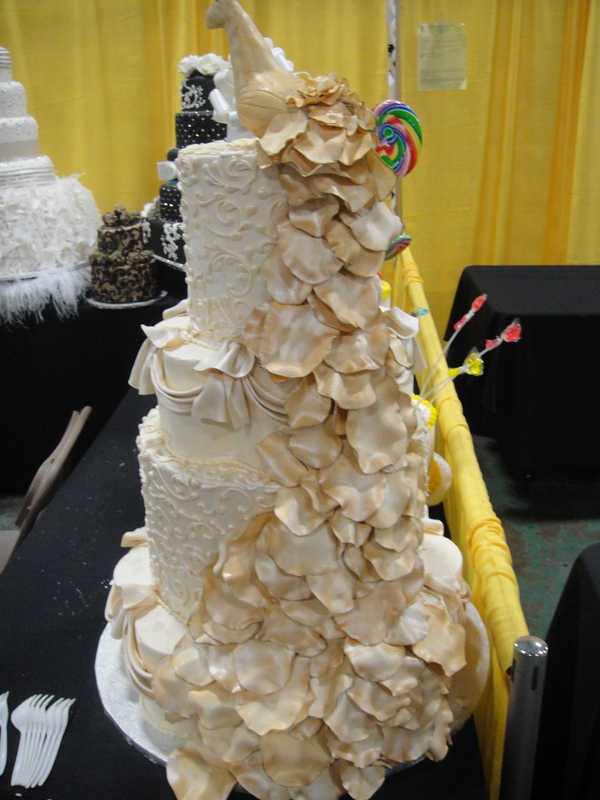 This entry was posted in bakeries, cakes, dallas, desserts, food, pastries, taste of dallas 2012, the cake ball company, the cake guys and tagged Bridal Cakes, dallas, Desserts, food, friends, texas. Bookmark the permalink. it was! 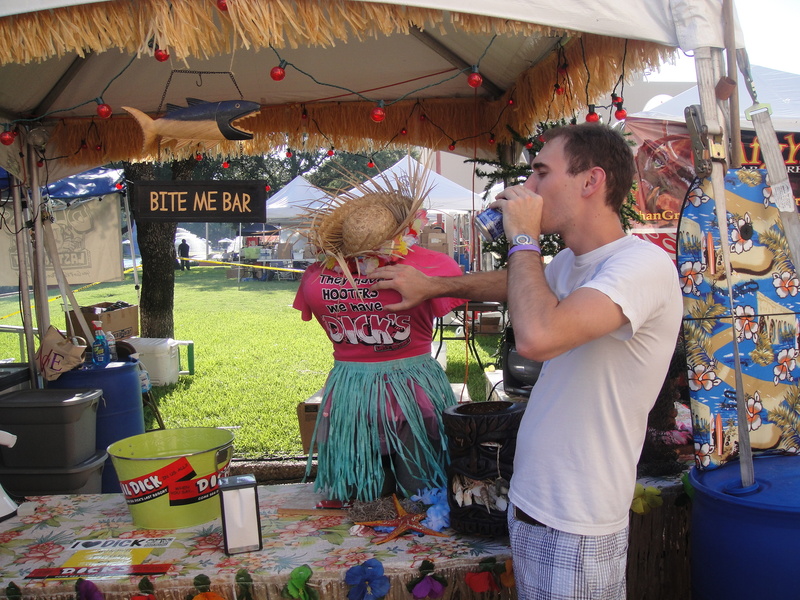 texas always finds reasons to throw food festivals! there are a ton that go on every year but i’d be 50 lbs. extra if i went to all of them! it was pretty amazing. i’m not even sure if this blog could hold all my pictures. haha. 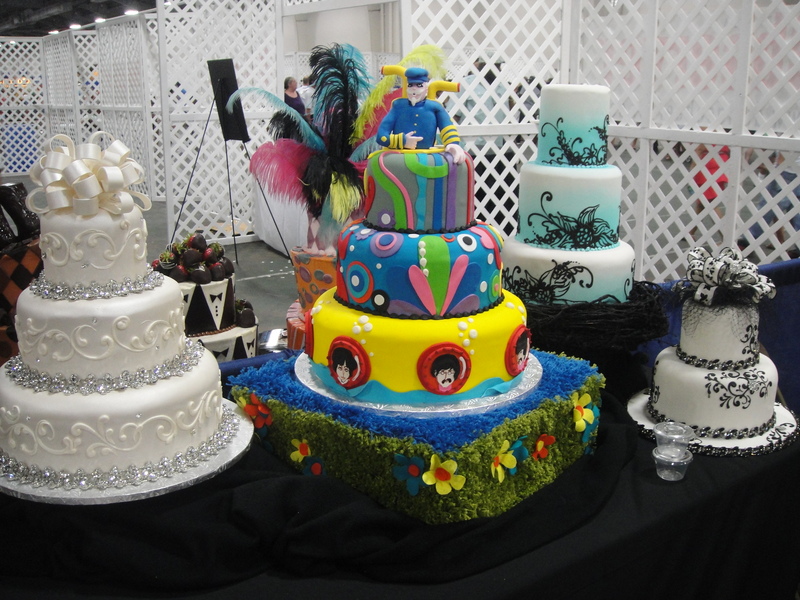 the cake guys are seriously so cool. and they have an amazing and talented staff! oh, it was. it was a delicious day. You’re soooo lucky!! I wish we had a Taste of Calgary that was this huge! 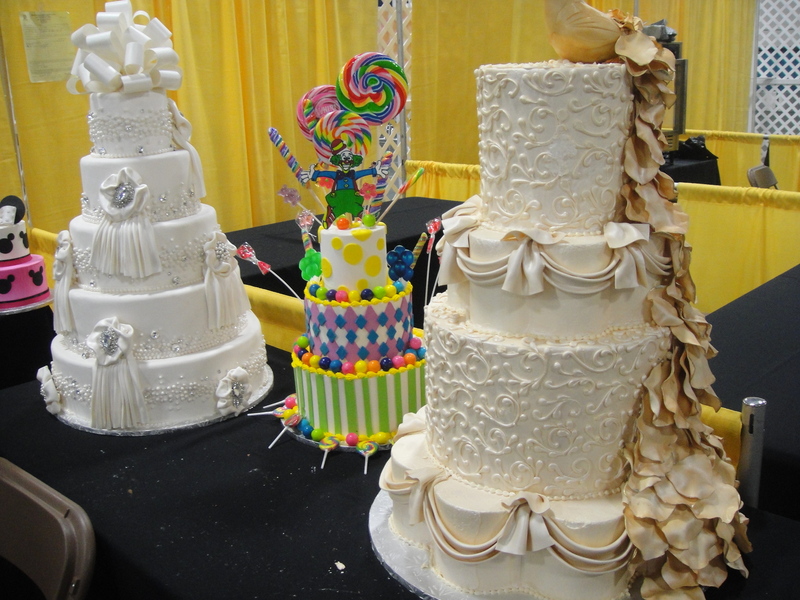 I loved those wedding cakes.. some day I have to learn how to work with fondant! I’d better start with those winesicles! I can’t believe how cheap food in the US is! In Sydney macaroons are around $2.50 each. I would have been buying the whole lot at that price! Oh my goodness!! Great photos, thanks for sharing with us. Absolutely lovely looking food!! wow–you’ve been busy! Always appreciate you stopping by foodforfun. 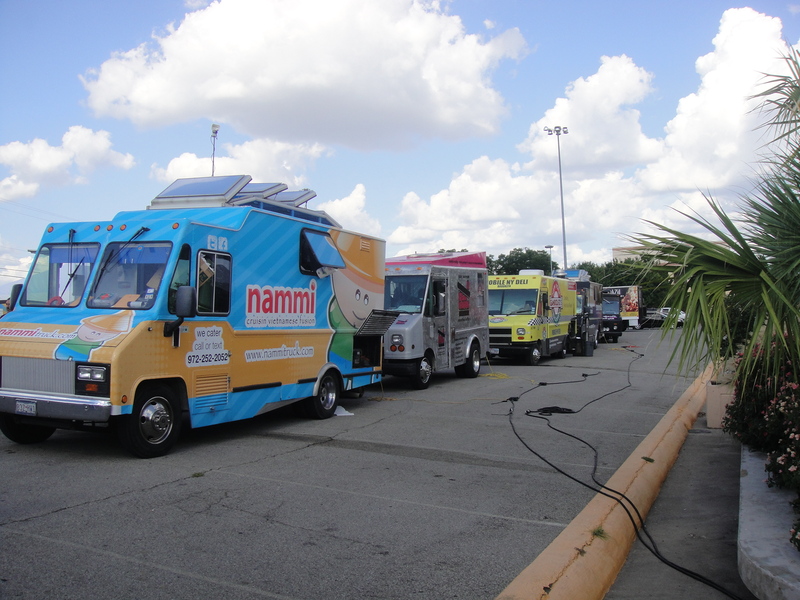 You found my food trucks:-) I’d love to have found as many as you did. This looks like so much fun! 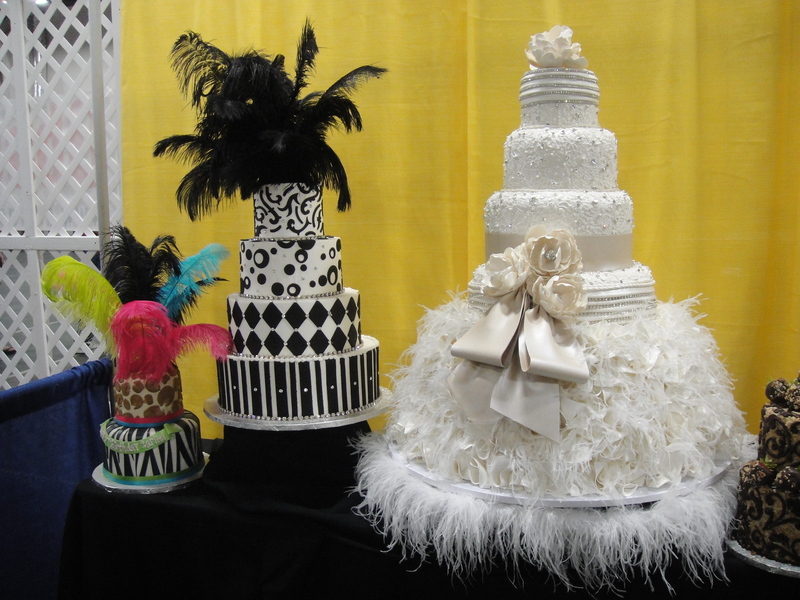 The cakes are elegant; wow! You’re making me miss Big D (little a, double l, a, s).